Dear SL, there was an informal poll to pick which hair color I should wear while blogging these new LeLutka skins, and Brunette hair won. I think the stereotype is that everyone wants to be a “Blonde Barbie” in SL but I definitely notice more fashion bloggers wearing Brunette hair colors more than any other color in SL. One of the many reasons that I adore SL is cos we can have matching brows and hair in an instant! Of course we’re at the mercy of skin designers, but having 3-4 options to choose from is amazing. 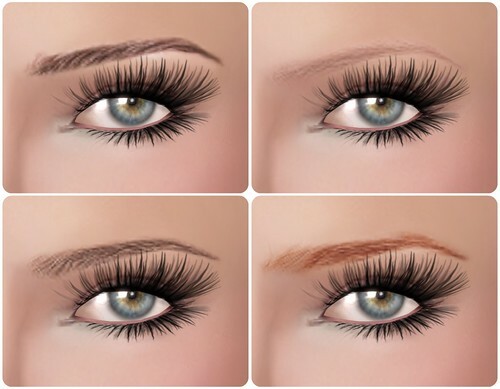 Check out all the brows options below! Here’s an interesting fact for you: the brows on the skin belongs to Aradia Dielli. These are her RL brows used on the skin, and they’re pretty fantastic. The new LeLutka “teeth” option is unlike anything else in SL right now. This is not on a tattoo layer but is teeth texture on a prim, worn with an alpha cut out on the lips. This will work on any skin in SL — and does not look bad from the side. The opening is not too wide to be considered “open mouth” but is more like parted mouth, but it is an interesting idea! Mila will be released on Friday, November 19th at LeLutka! ohh i didn’t know this! thanks for letting me know! i guess i have not seen any major skin designer do a prim teeth with alpha cut out on the lips. I also love your eyes! I’ve been looking for eyes like that for a long time, would you share where you got them from? Yeah, I’ve had PXL prim alpha cut out teeth in my inventory since like forever. They are not for sale though, though I think at some point hart gave them with a gift skin. Those teeth somehow make you look annoyed and/or mildly appalled…which is am improvement over vacant, I suppose. Definitely prefer the brown and the bun with that jewellery, looked more refined. Your blonde suits summery, beachy looks. So I made my character average of breast size, slightly more weight on her, brown of hair and eyes. (because it seemed at that stage in 07 that everyone had blonde or raven-black hair, and startlingly blue or green eyes. Isn’t it funny, then, that a ‘run of the mill’ RL look turns into ‘stand out’ in SL because of it? I am always trying to figure out which lips you get from where on your pictures. Then your lashes as well. I am guess its a tattoo layer lash but from where? The lips on this blog belongs to Lelutka Mila (it’s on the skin) — and the lashes are prim, not tattoo here. I prefer prim lashes, but tattoo lashes are good for people who cannot adjust prims well. I do Love Lelutka Skins, However i have been a little disapointed since Lola which was amazing. really Hoping they can Bring out another wow skin soon as im not impressed its not the best ive seen on you GoGo and you normally make all skins look super. No, don’t like the lips on this skin at all. It looks like the lips are an “Madonna’ ish” looking underbite. Way to overdone for my own taste. This skin looks lovely on you Gogo… I’m looking forward to checking out the red eyebrow on this skin! Very informative post ty! I have to agree with Gabi, I love those eyes and they are what I have been hunting for, for what seems like ages now! Care to share the name/maker of them?! They look fantastic with that skin! I love the skin. Thank you for having a great website. Can I ask where you got your eyes ? I love them! Love the skin, and am super jealous of Ara’s brows haha! It will be with more hairbase colours too?? I have always liked the overall look of Lelutka skins, but the lips really bother me for some reason. They look really unnatural compared to say, Dutch Touch or even Laq. I have never been a fan of LeLutka skins. They’ve always looked so flat and untextured to me. And the lips have always been really bland too. It’s good to see they’re taking a step in the right direction with Mila, but the “destination” is still a long way away. I forgot to mention, I really DO like the lips on this skin.